The project promises to bring prosperity to Pakistan, but much could go wrong. A month ago, Chinese President Xi Jinping was in Islamabad, where he unveiled a $46 billion infrastructure spending blueprint for Pakistan, to serve as a linchpin of Beijing’s drive to open new trade and transport routes across Asia and challenge the U.S. as the dominant regional power. Pakistani officials hailed the visit as a landmark and game changer. Despite decades of mismanagement and a feeble socioeconomic infrastructure, Pakistan does enjoy a strategic location. Among its neighbors, the only one with which Pakistan has maintained cordial ties since independence is China. Enjoying genial relations with a neighbor that is also a major power is clearly a boon for an otherwise diplomatically isolated Pakistan. For China, which has begun to build a presence in multiple regions, Pakistan is a gateway to the Gulf States and Middle East, where China seeks to showcase its soft power, and develop trade and diplomatic links. While the U.S. still dominates in the Middle East, China has certainly made ground over the past decade. It wants to continue that progress, and supplementing its energy trade, improving the balance of trade, and identifying new investment opportunities with more robust commercial links will be vital. Securing a route to the Indian Ocean via the port of Gwadar will do the job nicely, and will also help China develop its military presence in the region, while playing a role in its “String of Pearls” strategy. So Beijing’s decision to establish an economic corridor in Pakistan, switching access to the Middle East from a lengthy sea route to a much shorter (about 1200 km) road journey is a win-win. Xi’s visit saw 51 agreements signed, among them the pledge of $46 billion in investment. Many of the agreements focus on infrastructure development in Pakistan; however, the China-Pakistan Economic Corridor (CPEC) project is the standout development. The CPEC will run from the Chinese city of Kashgar to the port of Gwadar in Pakistan. 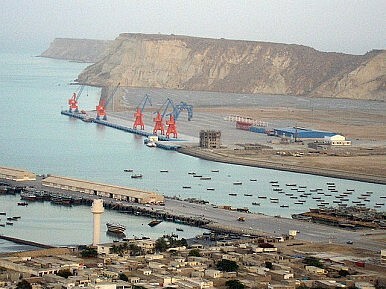 Gwadar is a deep-sea port that was initially developed and upgraded by the Chinese, who now have effective control. An all-weather, all-season port, Gwadar is strategically located, particularly vis-à-vis Dubai and Oman. Aware of its importance, China has now decided to lay down road (primarily) and air-train networks (gradually). The concept to develop the port at Gwadar first emerged several decades ago, although for many years little progress was made. In 2003, however, formal construction commenced under Pakistan’s former President Pervez Musharraf, with economic and technical assistance from China. The Pakistani military felt that existing ports were not sufficient for defensive purposes, and was seeking a second option. Beijing meanwhile had its eye on easier access to the Persian Gulf and Middle East. Now, with agreements signed and budgets allocated, the respective states are trying to eliminate or at least minimize the hurdles to CPEC that remain. Pakistan in particular has a job on its hands dealing with insurgents operating along the proposed CPEC. The country has been combating an Islamist insurrection for more than a decade. Nonetheless, it still hopes that Chinese investment will spur its long-underperforming economy, which the IMF projects will grow 4.3 percent this year. Beijing worries about militants from Pakistan’s FATA region possibly penetrating China’s western Xinjiang province, which has its own unrest, and may be eyeing greater pledges from Islamabad on that issue. Meanwhile, some political parties in Pakistan have expressed deep reservations about the CPEC, claiming that the ruling party is deliberately trying to alter the design of the corridor to favor the constituencies of its own MPs. Despite the concerns, the CPEC is potentially a game changer that could transform economic growth and inject some prosperity and capital into Pakistan’s frayed socio-economic fabric. However, it is unlikely to come to fruition in either the short or medium terms. Mega projects like the CPEC all too frequently run aground, either falling prey to a lack of vision or stalling on political tussles. If that happens to the CPEC, it would be a sad outcome for a Pakistan that desperately needs some good news. Muhammad Daim Fazil is a researcher who has an M.Phil (International Relations) from the National Defence University Islamabad, Pakistan. Will China’s Plans for Gwadar Destroy Fishermen’s Livelihood? Development around the coastal city, the heart of CPEC, has local fishing communities worried for the future.